Having vibrant, crazy, unnaturally colored hair has become a more popular trend in the last few years. If you love changing your hair color as often as you change clothes, then you're familiar with the struggle to find reliable, eye-catching, semi-permanent hair dyes. In this article, we review and compare other brands to Manic Panic Atomic Turquoise, a specific semi-permanent hair dye color and one of the many options made available by the popular cosmetic brand Manic Panic. What Is Manic Panic Atomic Turquoise? 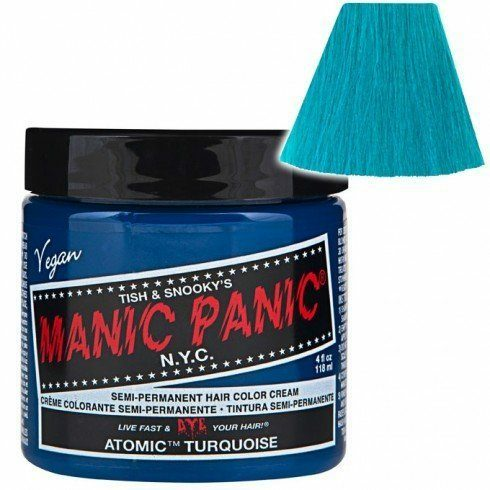 Manic Panic Atomic Turquoise is a popular, semi-permanent, vegan hair dye pigment presented by Tish & Snooki’s Manic Panic N.Y.C. If you would like to know more about this brand, you can learn more about it by visiting their official website. On bleached hair, this color can be outstandingly vivid. On natural hair, this color can provide a turquoise tint depending on lightness. This shade of Turquoise hair color can also fade into different shades of teal, sea-foam, and green. Manic Panic Atomic Turquoise is a water-based, semi-permanent dye that's amplified to provide the longest lasting formula that doesn’t fade after the first few washes. Manic Panic is PETA accredited and guarantees all of its own and its distributors ingredients are 100% vegan and never tested on animals. This has been their unique trademark since they entered the cosmetic world in 1977 and continue to make it their mission to provide the best vegan hair color on the market. You can buy a 4oz. Bottle of Manic Panic Atomic Turquoise for around $11-$18, depending on where you buy it, as prices vary by vendor. You can purchase this product and other colors on Amazon for about $14 for AMPLIFIED, or about $11 for a 4oz. Jar of their traditional formula. We picked a few similar products out there on the market to see how they compare, and they were all reviewed based on the same basis of quality, effectiveness, longevity, and price. Manic Panic Hair Color is PPD free! 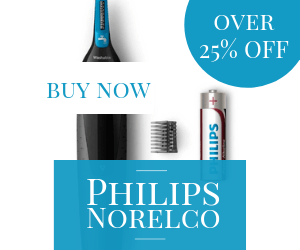 Ammonia-free and Peroxide-free! The AMPLIFIED bottle makes application easier and less messy than their traditional jar formula. For best results, they strongly recommend that you have blonde hair and allow the color to develop for a few hours when using their hair dyes. Some customers recommend letting the color cure overnight by sleeping with a bag or shower cap on. This helps provide vibrant results and can extend the life of the desired color. There were many customer reviews debating this topic, as the vibrancy and shade results differ based on the current color of your hair, how long they allowed the color to develop, and how an individual's hair takes to certain colors or dyes. Overall, customers seem impressed with results, and they keep coming back for more. The AMPLIFIED formula is made to last 30% longer than the traditional formula. Most customers say their color lasts from several weeks to two months, but it seems to vary based on color, your current hair color, application, or hair type. This and regular shampooing can also affect how quickly the color fades from your hair. Arctic Fox's semi-permanent hair dyes are made with vegan ingredients, no animal byproducts, and no chemicals. These long-lasting dyes smell great and work hard to condition your hair with each dye rather than damage the follicles. You don't have to bleach your hair to apply these dyes unless you are looking for a vivid color. Their colors last from about 4-8 weeks but these results vary by person and hair type. This product is about as easy to apply as its rival Manic Panic. The 4oz. bottle allows you to control the amount of dye you apply or mix without making a mess. For about $18 this product is also available in an 8oz bottle which is the perfect amount for multiple uses or for those individuals with, particularly thick or long hair. An overwhelming number of the reviews for this brand's hair dye colors are beaming with positive feedback from thousands of happy customers. From Amazon to Instagram, those that have tried this product rave about the vibrant and long lasting life of every shade they offer, on a variety of hair types. 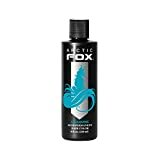 Unlike other similar products, Arctic Fox hair color does NOT smear, smudge, run, or rub off on skin, clothing, towels, or linens. As an additional benefit, their formula also smells fantastic! Arctic Fox advertises that its colors last approximately 4-8 weeks. Dozens of customer reviews second that notion for both bleached and natural hair. Provided that these colors are more so advertised to be more like a tint on natural hair. Many customer reviews made the comment that this brand doesn’t wash out, but rather gradually fades to lighter shades. This "colorwash" is an awesome mix of vivid colors with a shampoo that dyes your hair or helps maintain your existing color. This is a great way to color your hair while preserving its health, and it fully colors bleached or lightened hair and gives a radical tint to natural hair with just 1-2 washes. We recommend this product for use with its counter-part, Viral ColorwashBonditioner, which you can use as a pre-wash or as a daily conditioner to maintain color and moisture without the weight of build-up. One of the easiest applications ever! It is as simple as washing your hair with it. You can use it to color bleached hair, tint natural hair, or refresh your existing color safely with each wash. The recommended conditioner counter-part to this product is just as easy to use, offers all the same pigments, and keeps from causing any build-up. For best results use both products regularly to maintain color after the initial application. Customers remain impressed with the quality of this product as it gives the same amount of color as regular semi-permanent dyes. It not only comes in a variety of vivid colors, but it also comes in several natural shades and tones. The number and frequency of washings can increase the vibrancy of your color. You can also find these colors and shades in their 'bonditioner' formula, which they recommend you use with their colorwash shampoo for the absolute best results and longest lasting hair color. Since this product is a shampoo, you can use it every day or just once a week based on your individual color and hair type. You can also use the colorwash shampoo and conditioner to maintain your existing color as an alternative to regular shampoos/conditioners that cause build-up and advance color fading. As these products are more so intended for continuous use, it is not openly stated exactly how long this color SHOULD last. This also depends on the number of washes you've performed before final use of either product, as each use enriches your color. Herman’s Amazing Semi-permanent hair color is a professional vegan and cruelty-free product for a direct application. They offer several colors that come in a variety of shades. 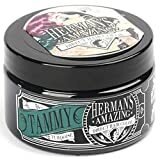 They offer two different shades of turquoise; TAMMY and THELMA Turquoise, but in this review segment, we will only refer to the shade TAMMY TURQUOISE., as it is the closest match the color Manic Panic color initially described in this article. This product only comes in jar form, which can be difficult to manage with or without an application brush. We highly advise that you bleach your hair before an application for the best results, but we recognize that it could also potentially work on light enough hair. However, neither the brand nor a number of customers who have tried this product recommended applying it to natural hair. Despite this product being made by a well-known, high-quality brand, customers don’t seem impressed by the results. The overall reaction is that if the color even takes to your hair, it doesn’t last for more than a few washes. However, some individuals with bleached hair have had success, and certain colors look great for a few weeks, and some recommend leaving the application of this product to the professionals if you want to use it. Customers suggest that only some colors from this brand are long-lasting and that some colors apply better than others. Overall, most individuals say their color lasted between 1-3 weeks total, but some other colors they've tried from this brand barely lasted a week, and some colors only a few days. Customers also report that colors often fade into or develop as different colors than originally intended. It seems this product has offered more disappointment than satisfaction to its consumers in both quality and longevity. Most colors do NOT last over 3 weeks max. Given the growing demand for semi-permanent dyes that last a long time, we know finding the right product for can be a daunting task. There are so many options beyond seeing a professional for artificial hair colors, and they each yield a variety of different results depending on your hair type and color, the product's quality, and application process you use. Everyone's hair and lifestyles are so different, and it's overwhelming trying to navigate through the ever-growing sea of products for changing our hair colors on your own, especially when you can't afford to be in and out of the salon every week or see a professional stylist and ask him or her questions. Regardless, some brands are making much better products and others have us running for the hills and our stylists. For this review, we compared all the same qualities of different brands to highlight the differences between Manic Panic Atomic Turquoise hair dye each one offers. Manic Panic still came out strong as the most effective and long lasting natural hair coloring product, and we give it 4 1/2 out of 5 stars. It's highly recommended for most hair types and promises minimal damage to your follicles, no matter what color you feel like today OR tomorrow.